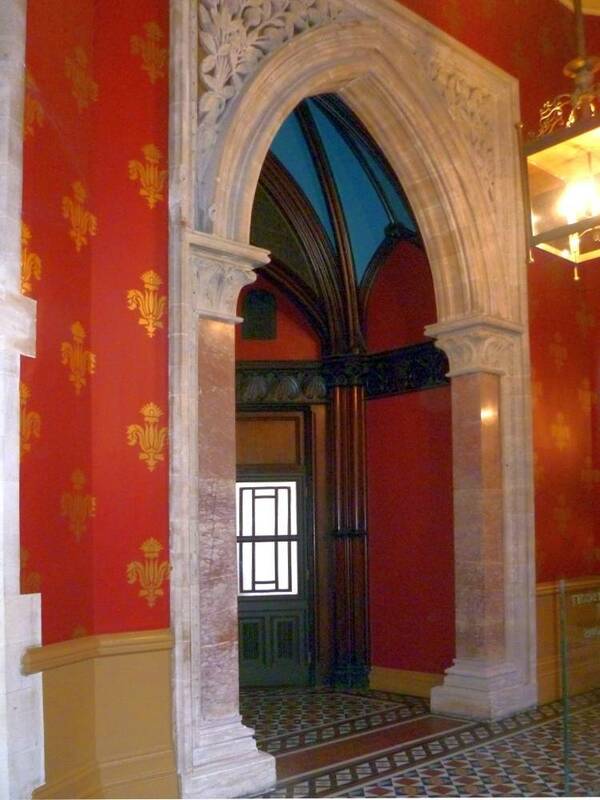 Left: Complex doorway opposite the Grand Staircase, with a fine Gothic arch. 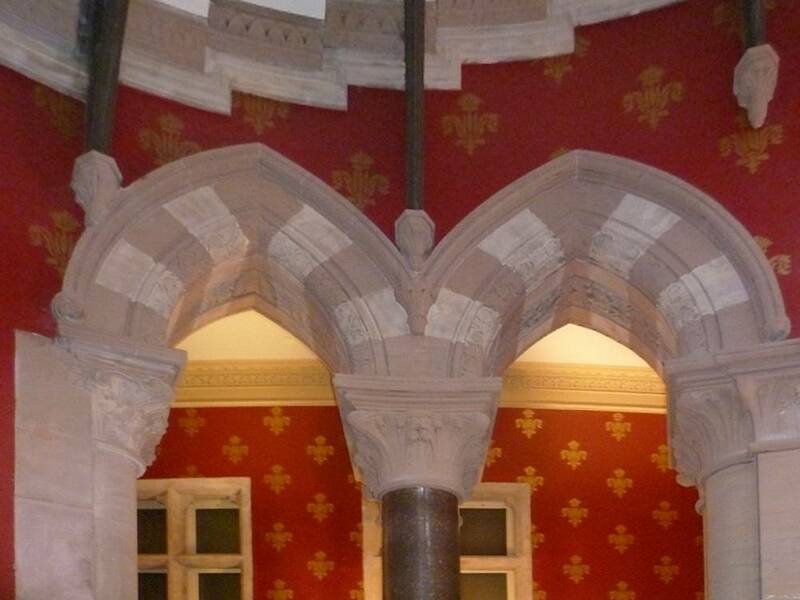 It has pink, white-veined marble posts, with two tones in the stonework above, and delicate floral and foliate carving in both the post capitals and the spandrels of the frame. The stone carving was by Scott's preferred firm of Farmer and Brindley (see Bradley 107). 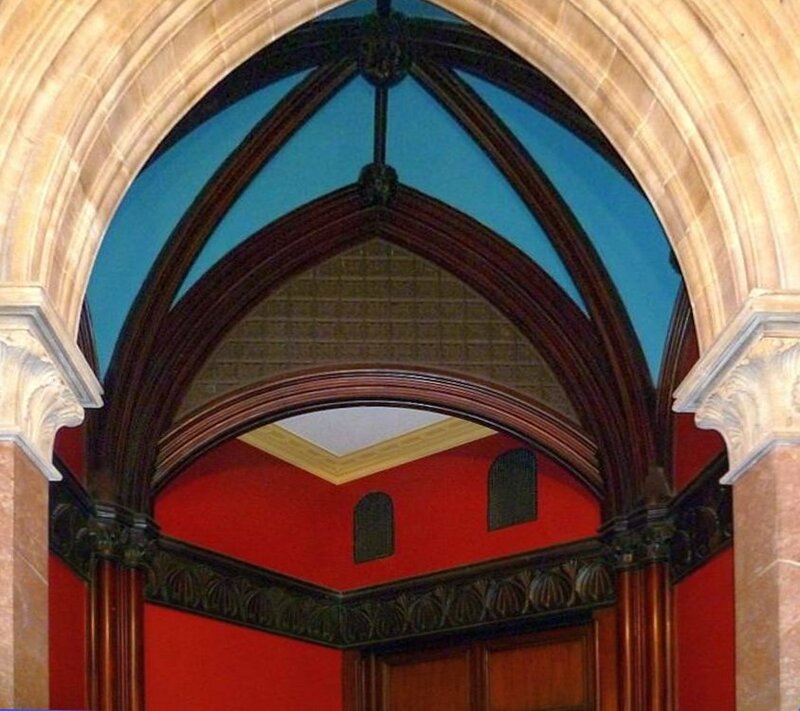 Right: Deep contrasting colours in the paintwork, and rich wood-carving, add to the dramatic effect of the ribbed vaulting inside. The earliest painted decoration was to designs by Scott, executed by Frederick Sang (active 1840-84, see Christie's); then the work was given to the firm of Gillow (later Waring and Gillow). These early schemes have been restored as far as possible. The result is striking. 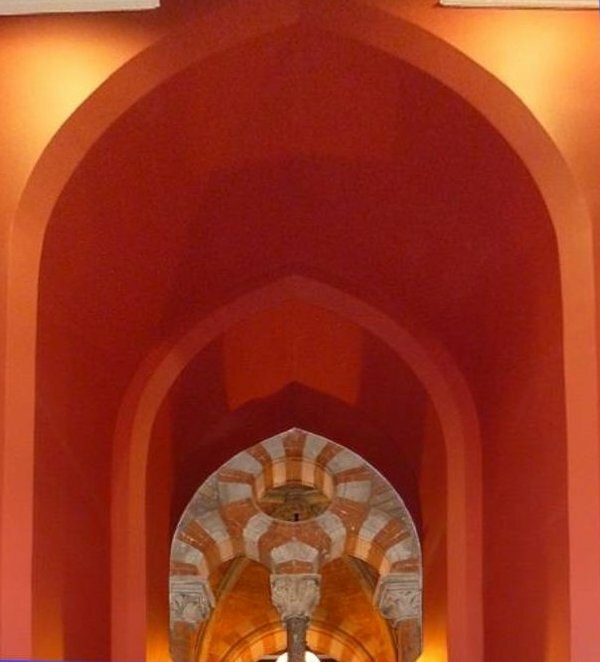 Left: Arches along the side of the hotel atrium (the covered area accessed from the former cab and carriage entrance). Right: Arches below the Grand Staircase, the supporting brackets and treads of which can be seen above. 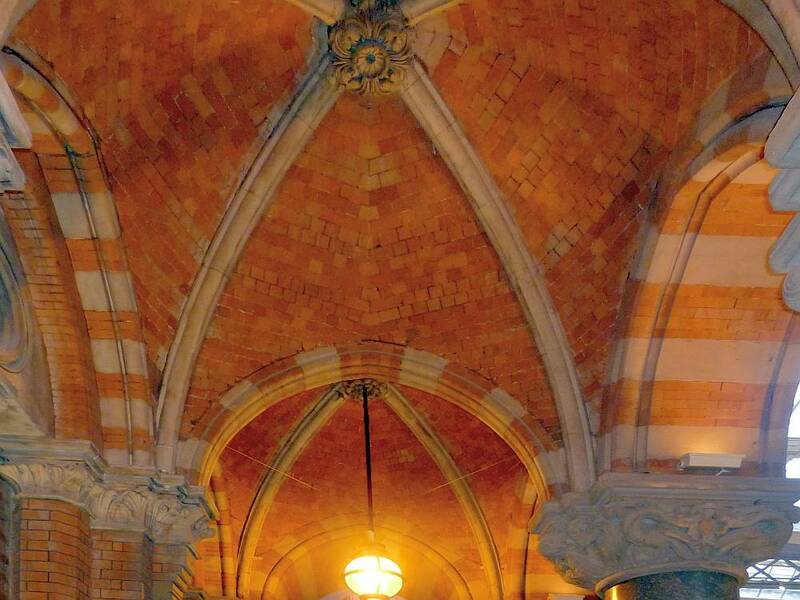 Left: Another glorious archway, recessed, with bright polychromy round the bull's eye, ribbed vaulting and then another, more round-headed arch beyond that — this furthest one with the brick polychromy seen in the window and door arches in the front elevation and the façades round the station concourse, and what is now the hotel's atrium. 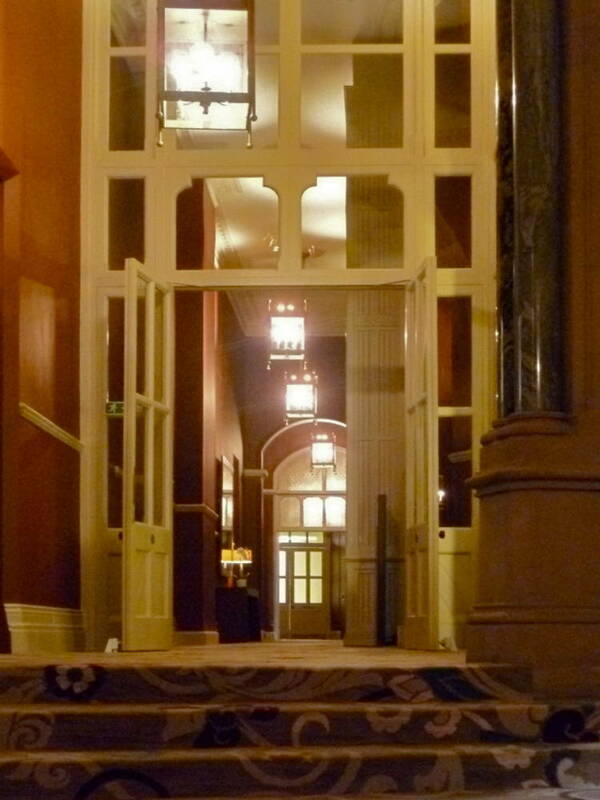 Right: A passage leading away to the hotel's rooms, the transition offering a mix of the old (a heavy polished pillar on the stonework to the right) and the new (light wood-and-glass partitioning in the centre, with a hint of exoticism in the shaping of the two lights immediately above the door. Admittedly, this was a description written on behalf of the Midland Railway Company itself, in a book dedicated to its chairman and chief executive. "Frederick J. Sang (fl. 1840-1884)." Christie's. Web. 26 October 2012. Williams, Frederick Smeeton. The Midland Railway: Its Rise and Progress; A Narrative of Modern Enterprise. London: Strahan, 1876. Internet Archive. Web. 26 October 2012.